I used to read a lot of novels. I would devour them by the dozen each month. Then, somewhere along the way, my fictional reading came to a near halt and was replaced with nonfiction. I traded in my adventures and mysteries for books like “Motivate Your Child”, “Who Got Peanut Butter On My Binder”, and “A Wife After God’s Own Heart”. Yep, my nightstand, desk, and several bookshelves are filled with these type of books. However, fro m time to time I find myself with a desire to read something on a more “girly” level. I love (clean) love stories. I love mysteries (with love stories.) I love adventures (yep, with love stories.) So I considered myself very fortunate to be selected to review The Secret Bridge from Lamplighter Publishing. Sometimes a gal just needs a break from all of the “How-to . . . ” books! Lamplighter is known for their old books. I love old books, don’t you? The smell, the frayed binding, the discolored pages . . . ahh. But don’t worry, Lamplighter doesn’t sell that kind of old book but rather republished books of old that are beautifully bound with fancy lettering. This particular book was written by Amy Feuvre. Feuvre’s gem was originally published in 1899 and is one of the most recent additions to the Lamplighter book collection. Reading this book was like watching an old BBC show in my head. The manners, the way they speak, the thought processes . . . it was wonderful. 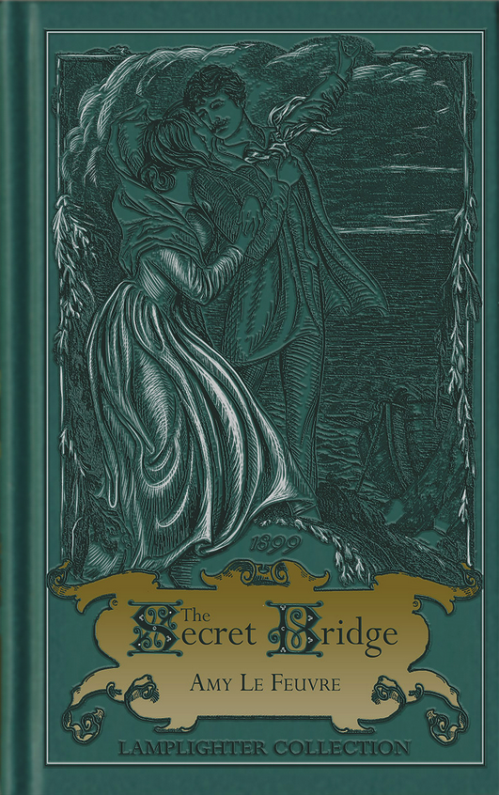 I read The Secret Bridge myself, in about three nights. So What Is The Secret Bridge About? Well, without putting too fine a point on it, it’s a twisty-turny love story. Young Bridget Channing finds herself in an unfortunate predicament which only gets worse. She was brought up and educated to be a lady, but now being in a new land she is forced to find work. After hardship proves too much, she accepts the marriage proposal of a Naval officer she barely knows. As soon as the couple is married, Godfrey Bullingham, her new husband, leaves on a one-year tour. Bridget is left with friends of Godfrey’s while he is gone for two reasons: (1) to enjoy an easy life while he is gone, and (2) to get to know her in-laws. Seems easy, right? Well, here’s the kicker, her marriage is a secret. She has to mingle within the town and make friendships under false pretenses. At first, she does so without much trouble, but soon enough . . . the trouble comes. There are two rival families in the land- the one she secretly married into, and the one she finds out she’s related to! Wait, what??? Yes, It’s like Pride and Prejudice meets Romeo and Juliet, although thankfully no one dies. The story is wonderful. It kept me up into the wee hours of the night because I couldn’t put it down! Seriously, it’s that good. What did I think of The Secret Bridge? Well, obviously I enjoyed it very much. I plan to let my 14-year-old daughter read it this summer. I expect she’ll devour it in a day (she loves love stories too.) It’s definitely written on a teen/adult level, which is nice. Many books that are written today don’t exceed a sixth-grade reading level. Some sophistication is always appreciated. You can grab this beautiful book on the Lamplighter website for $28, BUT if you’re a bargain seeker like me, I suggest you check out Lamplighter Book Club. You save 10-40% on the books, plus get free shipping. You can’t beat that!